The pumpkin-filled installation is now on display at the National Gallery of Australia in Canberra. Australia keeps going dotty for Yayoi Kusama — and this time, one of the Japanese artist's dot-filled installations is sticking around on a permanent basis. Acquired by the National Gallery of Australia earlier this year, Kusama's pumpkin-focused infinity room The Spirits of the Pumpkins Descended into the Heavens is now on display at the Canberra gallery, opening today, Saturday, December 1. The piece was first exhibited in 2015 and last seen in Australia earlier this year, in Brisbane as part of the Gallery of Modern Art's Yayoi Kusama: Life Is the Heart of a Rainbow exhibition between October 2017 and February 2018. 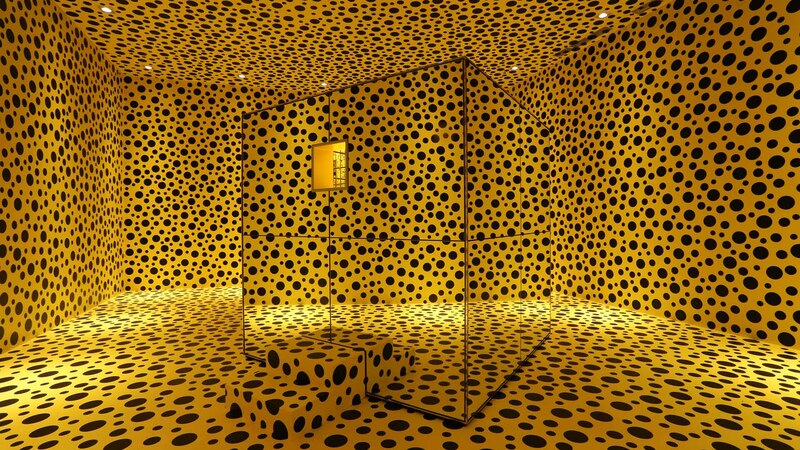 Comprised of a mirrored cube filled with yellow, dot-covered pumpkins, it's a quintessential Kusama work. Whether you're a devoted fan who considers visiting the artist's own Tokyo museum a bucket-list moment, or someone who has simply placed stickers around one of her obliteration rooms, you would've noticed that dots and the concept of infinity are crucial to her art — "our earth is only one polka dot among a million stars in the cosmos," she says. Inside the cube, the bulbous vegetables appear to create an endless field thanks to the shiny surface. On the outside of the cube, the structure's mirrored exterior reflects the yellow-and-black walls in the surrounding installation room — again, making it appear as though the pattern stretches on forever. The acquisition was made possible via a gift to the NGA from Andrew and Hiroko Gwinnett. "It has long-been my ambition to see a major contemporary Japanese artwork housed in Australia's national collection," said Andrew in a statement. "Kusama's playful installation is a legacy that will keep giving for generations to come." Find The Spirits of the Pumpkins Descended into the Heavens at the National Gallery of Australia, Parkes Place, Parkes, Canberra. Images: Yayoi Kusama, THE SPIRITS OF THE PUMPKINS DESCENDED INTO HEAVENS 2015 — Installation view at The Museum of Modern and Contemporary Art in Nusantara (Museum MACAN). © Yayoi Kusama. Courtesy of Ota Fine Arts, Tokyo/ Singapore/ Shanghai. / Courtesy of National Gallery of Australia, installation view.